We’re excited to have two tickets to give away to the Cleveland Home + Remodeling Expo, March 27-29 at the Cleveland Convention Center! 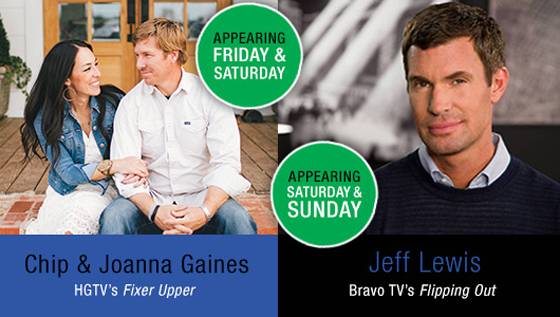 This three-day home improvement expo showcases the best new trends and products in home renovation and design. Features of this year’s show include a live butterfly house presented by Arcadia GlassHouse; decorating tips for small-space living by Perrino Builders & Furniture; a How-To Stage presenting step-by-step instructions for DIY projects; and a marketplace where you’ll be able to purchase products from local artisans and vendors. The Cleveland Home + Remodeling Expo runs Friday, March 27 through Sunday, March 29 at the Cleveland Convention Center on Lakeside Ave. downtown. For more information, including a schedule of events, check out www.homeandremodelingexpo.com. To enter to win two free tickets to the Cleveland Home + Remodeling Expo, leave a comment below letting us know what your favorite home renovation TV show is. The giveaway ends Saturday, March 21 at 11:59 p.m. ET. A random winner will be selected and contacted by email soon after. Good luck! Burritos and Bubbly readers are also eligible for a discount on tickets! Just use code BUBBLY15HR for an additional $1 off the price of each ticket purchased online at www.homeandremodelingexpo.com. I spend my Tuesdays watching Fixer Upper!! Seriously LOVE their style. I don’t have cable so I’ll have to go with a PBS classic – this old house! IT might not count completely as home renovation but I’m going with Flipping Out on Bravo! I enjoy watching Rehab Addict. Girl Power!